I've known Scott Tennant since 1995. I met him at the GFA festival in Northridge, when he came up to my display table, picked up my guitar, and blew my mind. Scott can really play. His right hand has a strength, suppleness and confidence like no one else. His left hand moves with perfectly natural speed and accuracy, and his musical ear and taste are exquisite. 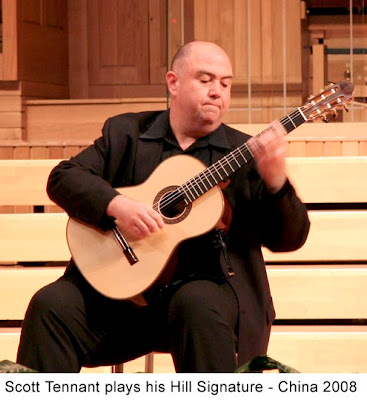 As a founding member of LA Guitar Quartet, as a virtuoso soloist, and as a teacher Scott's playing has touched not just me, but tens upon tens of thousands - or millions of people around the world. He's smart, and funny, and he has exposed me to all sorts of music that has added to my repertoire and changed my several times over. So, last year when he contacted me wanting a guitar, I was thrilled. Over the years I have shown him instruments, absorbed his comments, and now with the Signature model it seems I've made some instruments that grabbed his attention. 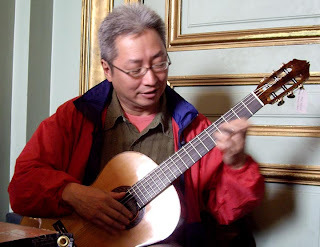 I took him 2 or 3 guitars to try out, he bonded with one, and the next morning he took off with it on tour of Russia, China and Japan, both with the quartet and as a soloist. For some time now Scott has been real wrapped up with his Daniel Friedrich guitars, and no wonder. 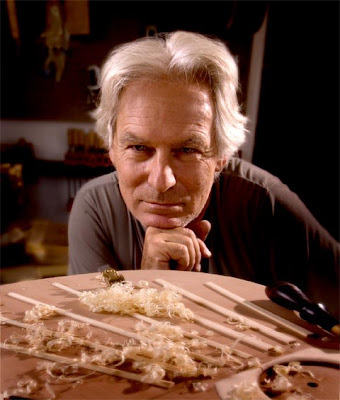 Friedrich has been making stellar, world class guitars for decades. They are some of the most prized instruments of any living builder. Now that he has chosen to include a Hill Signature guitar as a working axe I'm proud, and excited to hear him playing on it as much as possible. I absolutely love these guitars, but then I'm kind of biased. When an artist of Scott Tennant's stature chooses a Hill Guitar and plays it so beautifully, I am very, very happy. We must be doing something right. We at Hill Guitar are delighted to add Sylvan Music in Santa Cruz to our esteemed dealer group. I've known owner Al Markasky for decades, as long as Sylvan has been around. I've watched the store grow from a tiny repair and sheet music operation to one for the strongest retailers and service centers in acoustic guitars anywhere. They've got an remarkable selection of steel string instruments, old and new, and they have a respectable collection of classical guitars. With the addition of Hill Signature instruments and New World Guitar Player series and Estudio series, their selection got better! The first Hill Signature guitar that went there lasted less than a week. This has been a trend all over, keeping the Signature Models in demand, and in short supply. Production of these guitars is very limited. We delivered a cedar/Indian rosewood Signature Model (double top) to Sylvan Music just yesterday, and if your interested in such a thing you should go try it, because it probably won't be there for long. There are very few of these instruments available for sale at this time, and demand is strong. Although we are in the same region, Sylvan Music and Hill Guitar have never tried to work together, but I think this is a good collaboration. They are close to the University, close to downtown, and on a main route in and out of Santa Cruz, and they have so many instruments and accessories to look at they are a real destination. Playing Hill guitars in the context of many other instruments gives you the chance to compare, and hopefully get a sense of what is so good about our guitars. Sylvan has a nice sound room dedicated to just classical guitars, so the acoustics and privacy are ideal for trying out guitars. So I'm very happy to finally hook up with our home-boys at Sylvan Music. You should visit them soon! I didn't get into this line of work to be in business. It was more of a mystical choice, a compulsion, based on love of the sounds, shapes, smells and feelings that swirl around these guitars, both playing and building guitars. Yet, somewhere in the course of family life and many children I understood that I would have to accept some kind of role in business to allow me to pay for my guitar habit, so I could keep on doing what I love, and keep my kids somewhere out of musician's poverty. I reluctantly embraced "business" as part of what's needed for guitar making and guitar playing. It hasn't been easy, and it's definitely a work in progress, but I consider myself among the lucky ones to be working at something I love, and surround by talented and insightful people. Now along comes a meltdown. It's very annoying. It seems that while I and a host of colleagues have been spending our best efforts to do nice things and make the world a little better, other mammoth forces have been extra cynical and greedy - or epically careless - with the big world of economies, and it threatens to unravel much that we've done over the last five or thirty five years. Thankfully, life at Hill Guitar is still chugging along. People still need guitars, maybe now more than ever. Although I am quite aware of the power of world, national and local economics, it's not the only thing I think about, and we are still holding on to our plans and hopes in this special world of guitar. We're still making some truly great guitars, and we're even expanding our lines of student instruments, trying to provide our customers the very best instruments possible for their money and for their music. As musicians we're a little lucky at this moment, because we're practiced at hard times. We didn't get into this for the money. We got into it for the beauty, for the human contact, for the inspiration, for the personal and spiritual challenges that go along with it every day, regardless of what level of player you are. There is always something valuable and ongoing in the growth and communion that comes with music, and this is always available to us - in good times and in bad. We musicians are part of the solution, not part of the problem. We already know something about sacrifice. Through music we make the world better, through our passions and attention to detail we improve ourselves and our surroundings. This is why I actually feel a bit optimistic at this time, in spite of grinding catastrophic news. Sometimes it takes disappointment to remember what is really valuable in life. In a recessionary climate I see an opportunity to calm down a little, look around and rethink what's important, what offers lasting contentment and quality of life. This is our opportunity to re-assert real personal values. So I'm not giving up, not even letting up. This is a very good time for music. Musicians always have to deal with tough economics, it's the norm. We're used to it, grudgingly at home with it, adaptable. So let's keep it going. Here at Hill Guitar we're we try to make make instruments that make our musicians lives a little better. As musicians we all make music to make our daily world a little better. Keep it going. It's more important now than ever. Our first 2009 New World models have arrived. 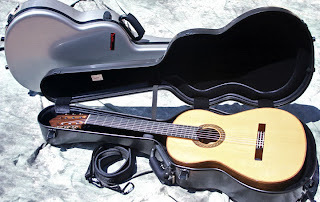 Standard classical models in the Player and Estudio guitar series. These full-sized guitars have 650mm string length, and are available with Englemann spruce or Western red cedar soundboards. All of our New World instruments have lightweight adjustable 2 way truss rods and come standard with an allen wrench. The Player series guitars are all solid woods with ebony fingerboard. The Players are really beautiful and sound terrific. These will be available in 628mm scale, cutaway and fingerstyle with cutaway and narrower fingerboard. Later next year expect to also have 640mm scale as well. The Estudio series guitars feature solid soundboards, laminated Indian rosewood back and sides and rosewood fingerboard. These are available in 628mm scale, cutaway and fingerstyle with cutaway and narrower fingerboard. There are also smaller body sizes coming in the Estudio line: 615mm, 580mm and 480mm, as well as 640mm. All our New World models are now available with a premium arched hardshell case. For more detailed images of our new models, please check out the Showroom at our website. For those of you unfamiliar with the GFA International Convention, if you are at all interested in classical guitar, you need to know about this. If you live in the greater San Francisco Bay Area, you need to attend. There will be many guitar builders showing their works, along with associated vendors, competitions, performances, lectures, masterclasses.... lots of activities. We, of course, would like you to visit with Kenny and try our Standup and Standard Signature model[s]. Kenny will also have Torres 1856, Rodriguez and Hauser '37 available at the show. The beautiful new facilities at the San Francisco Conservatory will be used for the competition and the evening concerts, and the elegant and classic San Francisco War Memorial and Performing Arts Center, a few blocks away, will serve as the central location for most of the daytime activities. Both facilities are located within a few minutes walk from a variety of hotels, in the heart of beautiful downtown San Francisco. Richard Patterson, Director of the highly successful Omni Concert Series, will serve as Convention Director and Co-Artistic Director. Renowned guitarist and Chair of the Conservatory Guitar Department, David Tanenbaum will serve as Co-Artistic Director with Mr. Patterson. We are excited to welcome some new faces to the convention, wonderful artists who are not seen often in the US, some artists who you may not have heard of but whose music we are confident will move you, and artists who are seen frequently touring in and out of the US, including Dusan Bogdanovic, City of Sao Paulo String Quartet, Thibault Cauving, Zoran Dukic, José Antonio Escobar, Shin-Ichi Fukuda, Boris Gaquere, Antoine Garth, Viviana Guzman, Aaron Jay Kernis, Pablo Márquez, Duo Melis, Gyan Riley, Terry Riley, Hopkinson Smith, Raphaella Smits, Pavel Steidl, Anja Strauss, Axel Strauss, David Tanenbaum, Marc Teicholz, Aliéksey Vianna, Xuefei Yang, San Francisco Conservatory Guitar Ensemble. Recognized as one of America’s most brilliant guitarists, William Kanengiser has developed a unique repertoire for his instrument, ranging from dazzling arrangements of Mozart, Handel, and Bartók to his innovative excursions into the music of Eastern Europe and the Caribbean. 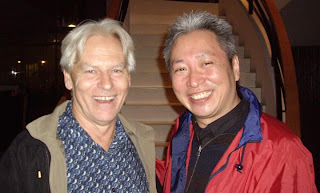 Praised by the Los Angeles Times for his “dizzying execution” and “exceeding vitality and warmth,” Mr. Kanengiser has performed in recital and as guest soloist with orchestras in virtually every major American city, ranging from New York City’s Carnegie Hall to San Francisco’s Herbst Theater, as well as throughout Canada, Europe, and Asia. This concert is suitable for children of age 6 and above. Daycare will be provided nearby for younger children during this concert for a modest fee. This very special event is open to students, teachers and observers attending the Festival. If you wish to participate as a performer for this master class you can download an Information and Audition Form to learn how to seize this rare opportunity. Only Suzuki students may audition to perform at the master class. Space is limited to six performers. We have just received new Bam Hightech Cases. These cases answer a frequently asked question, can we recommend any high quality travel cases? Bam cases. These very light-weight cases are very strong and provide an excellent choice for those looking for a protective case to use for travel. The interior provides an excellent fit for our guitars. We carry the Tweed and Brushed Chrome models presently. At this time, these cases are not easy to acquire, and we are offering them to Hill Guitar owners only. Price is $800. indestructible, bringing high isothermic and mechanical characteristics. Technical information about case interior & exterior. Kay Ezkanazi's Hill Crossover guitar was stolen out of her car. Kay has played a Hill Guitar Crossover for a number of years. She is a well known performer in Northern California, an influential teacher and one of our very good customers. I got a call from her early one Monday to tell me that her guitar had been stolen out of her car, along with her laptop and a briefcase full of sheet music. This is terrible, and she left me the serial number, date etc., just in case someone were to contact us about it. I promised to at least mention it here on the blog — you never know. She was offering a reward for its return, no questions asked. So, small world, when my right hand man Larry came in and I told him the story, and he said "Really? That's odd. Last week I was talking to to so and so at Fine Fretted Friends in Livermore about a completely unrelated French polish question, and while on the phone someone came into their store wanting to sell a Hill Crossover. Could this be a clue?" Yes, it could. Most retailers have been in that situation, with a stranger trying to sell something well below it's value for cash, and Michael went ahead an purchased the guitar, knowing that either there was something fishy, or he was at least going getting a good deal. And, as crazy luck would have it, Michael got their drivers license, vehicle license and address. Then, when they cashed his check, they were even captured on the bank video system. We were able to put Michael and Kay together, and sure enough it was her well loved guitar, they are working out a reunion. At this moment the police have custody of the guitar, but it should be eventually released to Kay. The cost of buying the guitar from the scoundrel SHOULD be picked up by the insurance company, in my humble opinion. I hope that's how it comes out. Regardless it's a small price to pay for the return of the guitar. There's more. They identified the perps and were going to get them. Two guys, one on parole, an the other on a no-bail parole, meaning when they pick him up he's going back to the slammer, period. I mean, how dumb are these guys? It sounds like they wanted to go back to prison. I worked for many years teaching guitar making in Soledad prison. I got to know a number of very serious offenders, and became close friends with some. I learned the humanity of many of these people, and understood something about how they got there. There was some crazy stuff, and eventually I started to see them as "Volunteers", felons who just keep doing bad stuff, way past the point of no return. Really, there's no explaining it. Teja Gerken invited Kenny to play at his monthly acoustic guitar showcase at San Francisco's Bazaar Café, which features both established and emerging players. 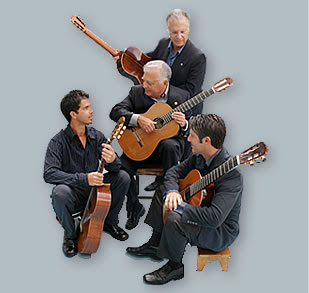 The performance format is a unique "round robin" where the three players are all on stage for the whole show, each playing one or two pieces, then passing on to the next player, and on around. It's a fun way to listen, and should prove to be an interesting evening of diverse guitar playing. Kenny will be performing on a guitar he made himself, his most current design Stand-up SIGNATURE model. Music he will play might include some Scarlatti sonatas, music by James Kline, Andrew York, Barrios, Kottke, Albeniz or Hill. Kenny has been a performing musician since childhood, playing guitar for over 40 years. 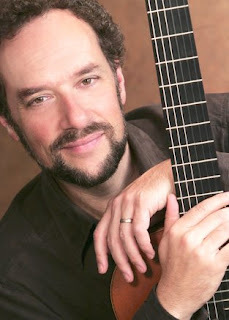 His unique ability with the guitar as both an accomplished guitar maker and an accomplished guitar player brings a very personal relationship to the music and to the instrument, and his spin on repertoire for the classical guitar is diverse and refreshing. You can check out and purchase his PILGRIMAGE CD of classical guitar music - international, mostly contemporary, all beautiful and distinctly personal. 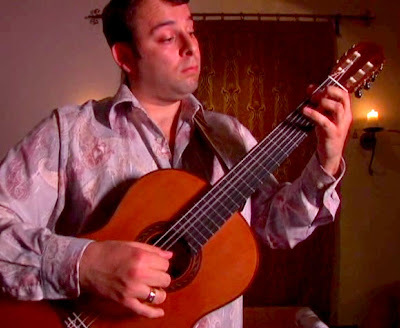 Today, Teja is no stranger to those familiar with contemporary steel-string fingerstyle guitar. Weaving together influences of folk, jazz, classical, and world music into a style that is uniquely his own, Teja's playing reflects his diverse musical interests. While many of his composition employ alternate tunings, two-handed tapping, percussive effects, and other extended guitar techniques, others simply rely on his keen sense of melody and movement. 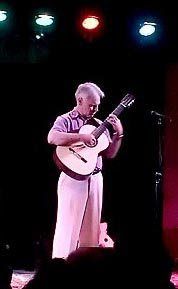 Within this framework, Teja has created a repertoire that appeals to fellow guitarists as well as to listening audiences, and while original material is his main focus, he can also be found playing Irish traditionals, the occasional jazz standard, or improvising on themes by classical composers. An active participant in the vibrant San Francisco Bay Area acoustic music scene, Teja is a regular performer at many of the region's venues. Putting a twist on traditional folk and folk blues styles, Mokai accompanies his soulful vocals with powerful grooves and smokin' blues riffs. His show-stopping set has earned him a reputation as a performer who delivers every time. His propulsive, fingerstyle guitar drives Mokai’s music, colored by elements of jazz and world music. Playful, then moving, his compositions touch both on big themes and intricate details. The deep commitment in his lyrics reflects years on the front lines of seminal political and environmental movements. This is the same dedication he brings to his performances at benefits for non-profits and important causes, as well as in hospitals and shelters with the Bread and Roses series. "A very well-known concert performer was in Salt Lake City this weekend for a recital and masterclass. I played in the class, and as I was setting up, he looked at my guitar and said "A Rodriguez. Nice." I played my selection; all went fine. At the end of the session, he asked "What year is your Rodriguez? It sounds wonderful." When I told him it was a Kenny Hill replica, and brand-new at that, he was astounded. "No way! Really? Wow. That's just amazing." He was 100% convinced it was a genuine Rodriguez." Photo of David Norton's 2008 Rodriguez model. 640mm string length. Here is the second of three of these small Torres models Kenny has built. The FE-18 is smaller than our Torres 1856 model. This is an appropriate guitar for the smaller player looking for a high-quality instrument. You can see more photos and information about the Torres FE18 model by clicking here. This guitar is listed in our SHOWROOM, where you can view more detailed and larger photos of the guitar. The third FE-18 string length is 615mm and will be available in May. Please contact us for more information on this guitar. Body depth: 3 5/8 - 3 3/4"
Almer Imamovic Plays Hill Signature Stand up Model featuring a double top: Western red cedar exposed, Nomex and European spruce interior. His guitar is Indian rosewood and has an elevated fingerboard, and sound ports. 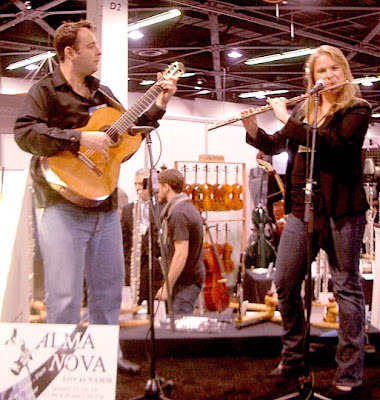 We recently received a DVD with a number of selections of Almer solo and AlmaNova; Almer and his flautist partner, Jessica Pierce together. A. Lauro's Waltz #2 & 3, and Asturias. You might expect a tiny guitar to sound like a toy. Without any hyperbole or hype, it is something unique and surprising to be experienced - sweet, loud, even and light as air. 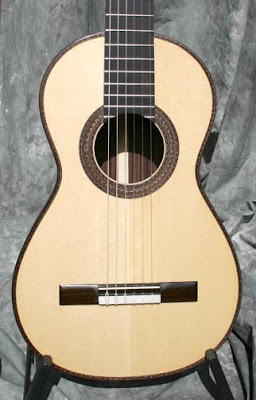 The guitar designs of Antonio de Torres have long held a fascination for me. His work is elegant, exquisitely crafted, with a breathtaking eye for line and straightforward design. I believe that guitar players of all levels, regardless of their advancement or economic strength, have a natural right to good sound and good playability. 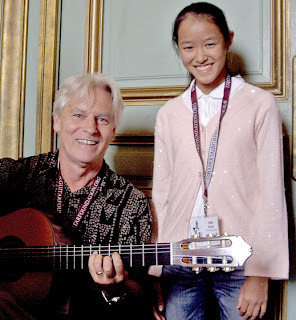 Frank Longay is an internationally recognized teacher of the Suzuki guitar method, and it is his (and my) opinion that children at all levels need quality instruments to make their efforts at making good music pay off. 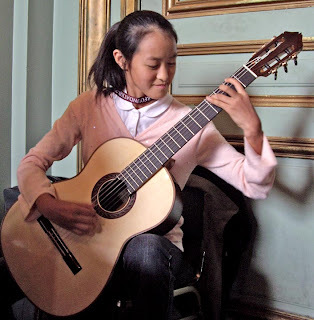 Inexpensive guitars may enable a student to learn basic technique, but in the bigger picture a poor guitar can actually become a barrier to developing good sound and expressive playing. So when Frank started asking me to produce smaller guitars for advanced young players, I turned to Torres for design inspiration. In looking through Jose Romanillos' definitive book on Torres I found a photo of Torres FE 18 from 1864. This is a small guitar, but in its own way it is very aristocratic and quite appealing. I actually just went to the photocopy store and blew up the photo until it reached the right measurements, transferred that shape to a set of construction patterns and molds, and put this guitar into production in my artisan shop. In spite of having the advantage of power tools, much of the way we build guitars here in my Ben Lomond shop is not much different from what Torres must have done. And making a small guitar is just as much work as making a full size one. But it sure is cute. I built this Torres FE18 model for Frank Longay and his students, but before I was done I knew I wanted one for me. Now I'm building a second and a third one, simplifying some of the ornamental elements with the hope of keeping the price under control. In the near future I will be trying out this design with 615 mm string length an, and possibly even smaller. I won't know the limit without trying. I know from long experience that a smaller body or a shorter string length in no way means a smaller guitar sound. Not at all. My Torres 1856 model is quite small, but in blind tests no one can identify it as small by listening. I have also made many Panormo style guitars which are loud and potent. So this now model is loud, rich, with a big bass and a pure treble, and with the 632 mm string length and 50 mm nut width it plays like a dream. This is a perfect guitar for a young person who has been studying hard and deserves an upgrade to a real concert level instrument without the bulky discomfort of a full size guitar. It is also a perfect instrument for anyone of any age who wants a guitar that is easy to play, comfortable to handle and, travels well. I'm thinking that this is just the first in an unfolding series of smaller guitars, aimed at filling a need for high quality guitars in smaller sizes. I am watching to see what the need is. I hope you can try one soon. French polish is fragile and seems to attract sharp objects, scratches easily - fingernail marks sometimes show up even when the guitar's in its case! Restringing is a task offering the opportunity to jam the string end into the top as you thread the string through the bridge. 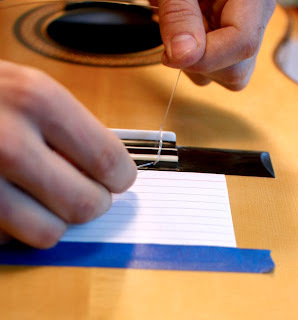 As a rule, we lightly tape a 3 x 5 index card to the top flush with the bridge with a low-tack masking tape, protecting the top from any stray string marks.